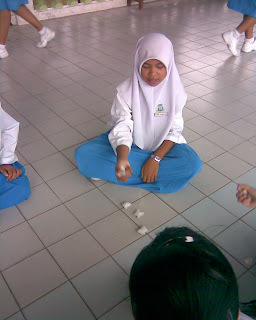 In one of my English class; discovered a number of students who had never played traditional games like 'ting ting' or 'batu seremban'. Today I decided to spend the whole lesson just for the girls to learn these two games so that they won't be so 'city-girl-like'. What fun we had!!! We made so much noise that I had to hush them. A few Chinese girls played fives stones for the first time. Wasn't easy as they had to coordinate the throwing and catching. 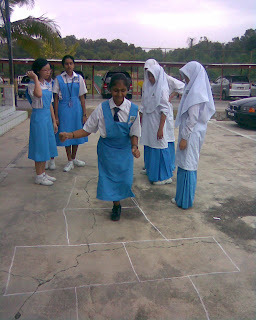 We drew lines at the car park and the girls hopped up and down with all types of rules. I was tempted to join them but did not; as usual, I am not very sporting when it comes to play. 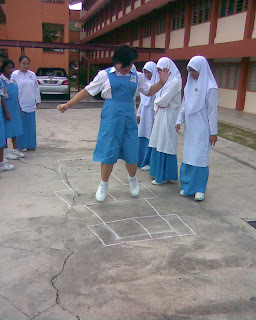 When I came home, I did try playing five stones with Lyn and found that my coordination is totally cacat. Does ur cavebaby know any of these traditional games? Can introduce to her. Both my kids are into playing five stones now.